Alien Crush (エイリアンクラッシュ, Alien Crush?) is a pinball game developed by Compile and published by Naxat Soft for the PC Engine in Japan in 1988. It was later ported for play in North American and published for TurboGrafx-16 by Turbo Technologies the following year as a launch title. It was later re-released on the Virtual Console and on the PlayStation Network, published by Hudson Soft. The game is the first installment in the "Crush Pinball" series. It was followed by three sequels, Devil's Crush, Jaki Crush, and Alien Crush Returns. Alien Crush features a science fiction theme reminiscent of the film Alien. Essentially, the player is "fighting" against the aliens with their pinball skills. 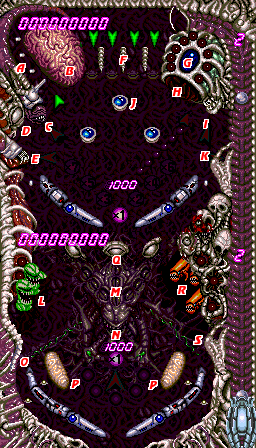 The playfield of Alien Crush consists of two main screens arranged vertically, with a pair of flippers at the bottom of each. The play stops momentarily as the ball shifts from one screen to the next. There are also several hidden/bonus rooms. These hidden rooms mainly involve destroying all the aliens (or several waves of aliens) for bonus points. The player is given the choice of a fast or slow ball speed and two different music tracks. : Press the direction pad in any direction to operate the left flipper. : Press the I button to operate the right flipper. Also used to deploy the plunger. : Press the II button to nudge or shake the table, which can alter the trajectory of the ball. Also used to deploy the plunger. : Press the Run button to begin a new game, or the pause the action mid-game. : Press the Select button on the title screen to choose the speed of the ball and the background music played throughout the game. Before you begin a new game, there are two selections to make. This is a bit of a mislabel. While choosing Slow does make the ball generally move slower, it doesn't stop the ball from moving as fast as it does when you choose Fast. Rather, it affects the perceived "tilt" of the pinball table. Choosing Fast will make it so the simulated table is at a steeper angle than it is on Slow, so the ball picks up speed faster. This select has no effect on the gameplay, it simply allows you to select which background music plays through the majority of the game. Lunar Eclipse is more of a rock themed song while Demon's Undulate gives the game a spookier atmosphere. During play, you can only view the top half or the bottom half of the pinball table at any one time. The entire table is presented on the right. Each of the interesting positions around the table are indicated with a red letter, whose function or purpose is indicated in the table below. Each new ball starts out in the lower right corner of the bottom half of the table, with the ball on the plunger. Press and hold either or to deploy the plunger. You are not required to hold it down until the plunger is fully pulled back, but the further it is pulled back, the faster it will rise to the top. Once released, the ball will travel up the lane along the right and into the top half of the playfield. Once the ball is on the table, you must use the flippers to keep it in play. If the ball sinks below the two flippers in the top half of the table, the ball will drop down to the bottom half. If the ball sinks below the two flippers in the bottom half, you will lose one ball. If you have any balls remaining, the next ball will appear on the plunger and play will continue. It is possible to obtain extra balls by reaching certain point amounts or achieving certain conditions. Points are awarded for hitting various targets throughout the table. Additionally, many targets contribute to a bonus point pool which is awarded whenever a ball is lost. Some targets even increase the multiplier which gets applied to the bonus point pool. Along with the targets on the table, certain conditions can cause portals to open up which transport the ball to a bonus stage. There are four different bonus stages altogether, described below. Slime 500 pts. each By sending the ball up this lane with enough speed, you will destroy all of the small slimes. If all the slimes are destroyed, a stopper will temporarily appear below the top half flippers, preventing the ball from slipping through the flippers. Brain Buster 1000 pts. Hitting the frontal lobe of the brain is difficult to do, but if you hit it 10 times, this brain will actually crack open and release an alien. Hit the alien as it tries to escape in order to claim 500,000 bonus points. Dead Bones Lock A 2000 pts. 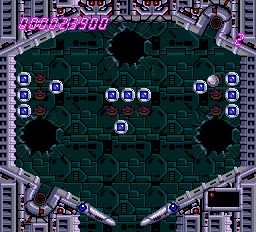 Whenever a ball exits a bonus stage, or gets picked up by the mouth in the lower half, it is ejected from this point. If the ball enters this mouth while a green arrow is pointing to it, it will spit the ball back in play. However, it there is a yellow arrow pointing to it, it will send your ball to Bonus Stage 3. Eyeball 3000 pts. Hitting this tucked away target will cause the three bumpers in the top half of the screen to change position. It will also increase the bonus point pool for the top half. Dead Bones Lock B 2000 pts. If this mouth opens up with a green arrow pointing to it, it will spit the ball back in play. However, it there is a yellow arrow pointing to it, it will send your ball to Bonus Stage 4. Upper Gate 1000 pts. each As the ball drops from the top of the screen, it must pass through one of these four lanes. Whenever it does, it turns unlit lamps on, and lit lamps off. Whenever lamps are turned on, there is a chance that one of the arrows on the top half of the screen will light up. Top Half Bonus Count 0 The lights around the shell indicate how much bonus has been collected through play within the top half of the table. Tentacloid Lock 1000 pts. When a green arrow points up to the tentacles, allow the ball to be caught by them to receive an early reward of the bonus points accumulated in the top half, before the ball is released and play resumes. Dead Bones Lock C 1000 pts. If this mouth opens up with a green arrow pointing to it, it will spit the ball back in play. However, it there is a yellow arrow pointing to it, it will send your ball to Bonus Stage 1. Bumper 200 pts. each Hitting one of these three bumpers sends the ball rebounding off of it at a high speed. Hitting the eyeball (point D) will cause these bumpers to rearrange. There are a total of eight different arrangements before they start to repeat. Upper Claw 2000 pts. Ordinarily shut, this claw will open under the right circumstances, allowing the ball to return down the chute and back to the plunger. Left Targets 1000~2000 pts. If you manage to strike all three of the targets, the bonus multiplier will increase. Bottom Half Bonus Count 0 The lights throughout the middle indicate how much bonus has been collected through play within the bottom half of the table. Alien Mouth 0 If you succeed in striking all of the left targets and the right targets, the mouth will open. If you get the ball inside, you will receive an early reward of the bonus points accumulated in the bottom half. Afterward, if the arrow leading to it was green, you will resume play in the top half of the table through Dead Bones Lock A. However, if the arrow was yellow, you will be transported to Bonus Stage 2. Alien Tail 1000 pts. This tail closes off the left outer chute, preventing the ball from escaping through a path where it becomes unrecoverable. Scorpion Bumper 500 pts. If you manage to hit these bumpers 10 times, they will hatch and a small alien will race up the screen. Destroy the alien for more bonus points. The bumper will reappear in place shortly. Deflector Eye 500 pts. Striking the deflector eye at the top of the bottom half of the table will increase your bonus point pool by 1000 points. Right Targets 1000~2000 pts. If you manage to strike all three of the targets, the bonus multiplier will increase. Lower Claw 2000 pts. Ordinarily shut, this claw will open under the right circumstances, allowing the ball to return down the chute and back to the plunger. There are four Bonus stages, each with their own objective. This bonus stage is accessible by hitting the ball into the open mouth next to the Tentacloid monster on the right side of the top half of the table when the arrow pointing to it is yellow. In this bonus stage, there are a set of bumpers. Most of them are stationary, but some of them move. Next to or below some of the bumpers are three sets of three lights that engage whenever the ball passes over them. The objective is to light up all nine lights. Upon doing so, you will receive a bonus for every red and green light that appears. Red lights are worth more than green. This bonus stage is accessible by hitting the ball into the open mouth of the alien in the center of the bottom half of the table when the arrow pointing to it is yellow. 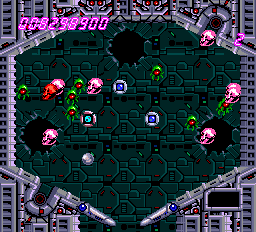 This bonus stage contains a large number of aliens and skulls. They bounce around the screen. Any time the ball hits one of them, they turn red for a brief period of time. If they happen to move over one of the holes in the background while they are red, they will fall in and are removed from the table. You will earn bonus points for every skull and alien that you manage to knock into the holes. This bonus stage is accessible by hitting the ball into the open mouth above the eyeball on the left side of the top half of the table when the arrow pointing to it is yellow. 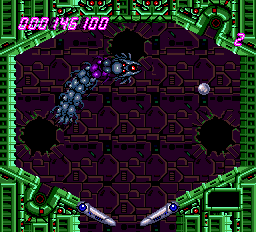 During this bonus stage, a centipede-like alien escapes from one of the holes and marches around the screen. Whenever you hit the head or a segment, it changes color. If you manage to break through the center of the centipede, all of its segments scatter from its body. The head will still move around and may occasionally duck into a hole, only to reappear moments later. When all of the segments and the head are destroyed, another centipede will appear. Bonus points are awarded for every head and segment that you destroy before the ball is lost. This bonus stage is accessible by hitting the ball into the open mouth below the eyeball on the left side of the top half of the table when the arrow pointing to it is yellow. 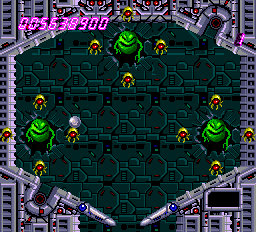 This bonus stage starts out with three large aliens appearing from the holes in the background. Each large alien is surrounded by four smaller aliens. The large aliens are invulnerable until all four of their smaller aliens have been removed. The goal is to hit the ball into the aliens until the small aliens are defeated, at which time you must hit the ball into the remaining large alien. 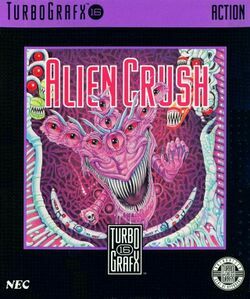 In an unusual twist for a pinball game, Alien Crush actually has an ending. It's incredibly short, and you need to score 999,999,990 points in order to view it. However, based on average gameplay, it would take approximately ten hours to reach this score. The video presented to the right demonstrates what happens when you accomplish this feat. This page was last edited on 19 July 2016, at 01:34. This page has been accessed 2,317 times.